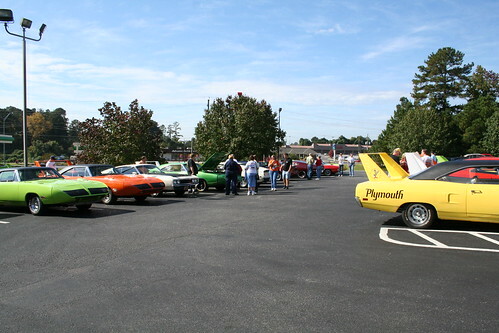 This is NOT a staged photo; this is what happens when over 100 Aero Cars come to town. 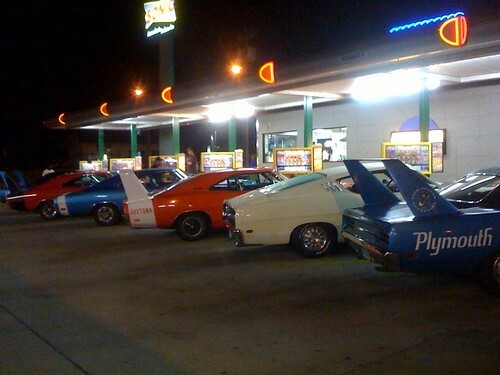 There are two Dodge Daytonas, a Charger 500, a Ford Talladega and a Plymouth Superbird all lined up at the local Sonic having a burger and fries just like it was 1969 all over again. Man, it was cool! 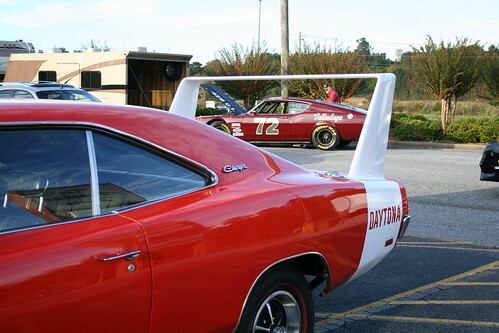 Once every five years there is a reunion of all the NASCAR Aero Cars (factory built production vehicles with special aerodynamically maximized bodies for high speed racing on the Super Speedways) held at the Talladega Super Speedway. 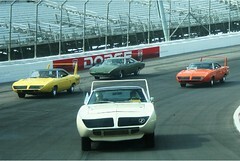 In 1969 the war between Ford and the Mopars was really beginning to heat up. 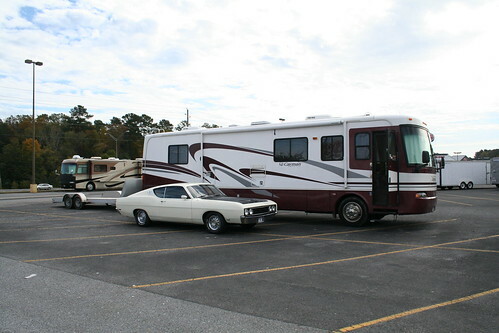 Many of the cars drove in, some were shipped (one came from New Zealand), some came on open trailers and others in enclosed trailers. However, all most all of them hit the streets when they got to town. 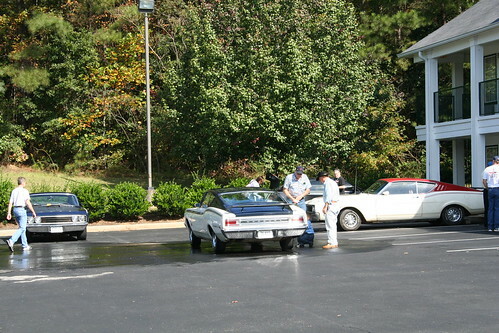 In 1968 Ford kicked the Mopars around on the race track with their new “Sportback” styling on the Ford Torino and Mercury Cyclone. 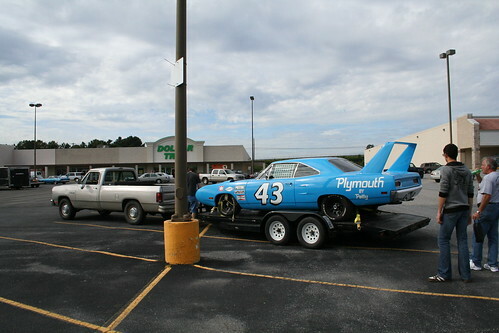 The Fords were so fast even Richard “The King” Petty gave up on the Mopars and drove a Ford in 1969. 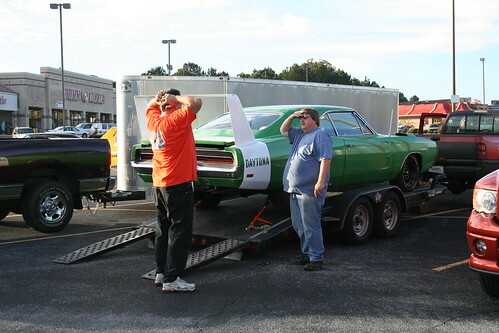 For the new season Dodge planned a full fledged attack with a tweaked 1969 Dodge Charger 500. It had a special sloping rear window and a flush mounted grill to make it more aerodynamic and faster at high speed. 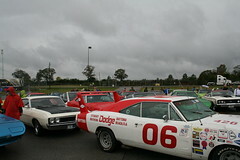 Dodge made one big mistake; they started talking about it before it got to the track. 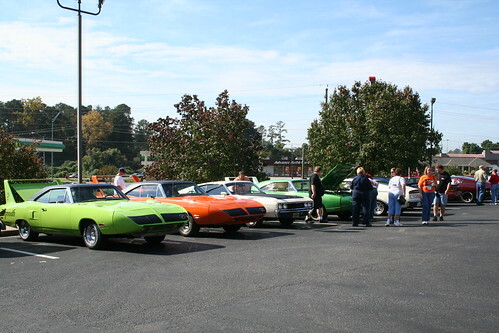 The Motels in town became instant car shows! 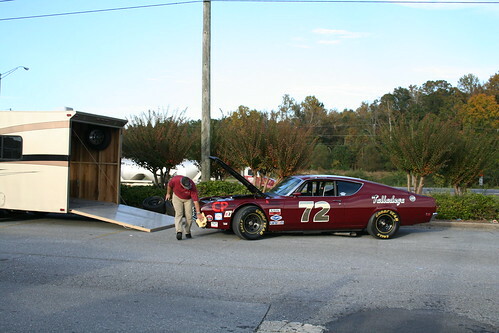 Ford knew the new Charger would be strong competition so the Blue Oval boys quietly went back to work and created their own “better” version of the Torino and named it after the new fastest track on the NASCAR circuit, Talladega. 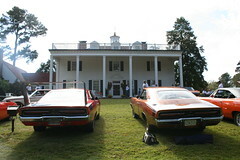 It had an extended and sloping front end and the entire car was lowered an inch to keep it ahead of the new Charger 500. It worked, for a while. 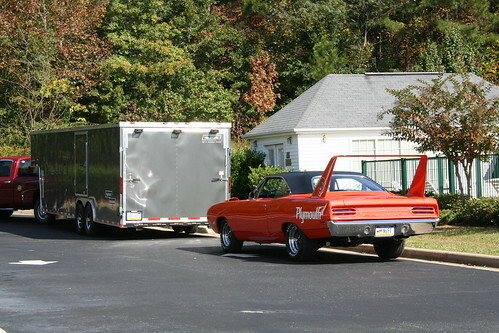 Dodge again went back to the drawing boards and by mid-season delivered the wild winged 1969 Dodge Daytona to the NASCAR Super Speedways. It gave the Fords and Mercurys all they could handle. 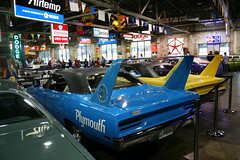 In 1970, in order to get King Richard Petty back in a Mopar, Chrysler built a similarly winged Plymouth Superbird. 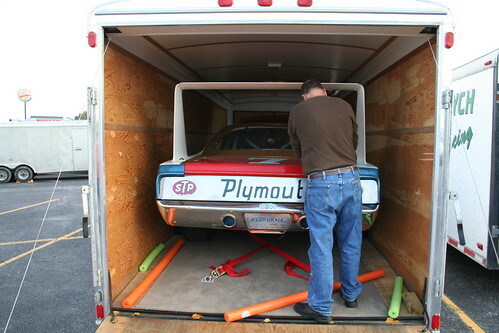 Unfortunately, by 1970 Ford had pulled out of racing and NASCAR was writing rules to neuter the Aero Cars to the point they were no longer competitive. That was a different time but every five years those Aero Monsters with the Hemi engines return to the Talladega Speedway to remind us all of the way it once was. 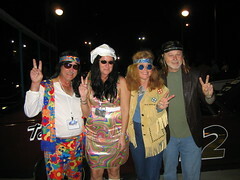 In 2009 on November 1 we helped burn the memory of Aero Cars into the minds of all who would watch. 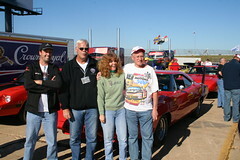 These cars are driven and range in condition from rough drivers to beautiful show winning cars. 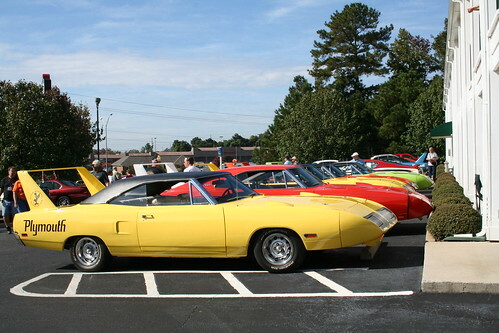 The Daytona-Superbird Auto Club held its reunion from October 28 through November 1, what follows is a recap of all the activities. 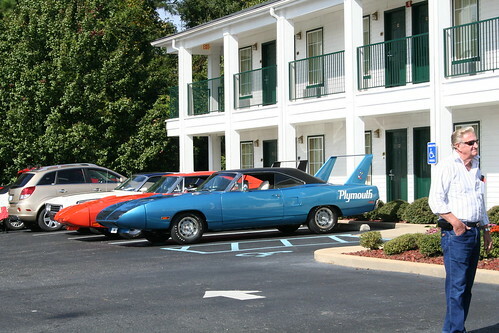 If you want to have an awesome experience and hang out with some of the best car folks you will ever meet get an Aero Car and meet us next year for the 41st Reunion at a location yet to be announced. 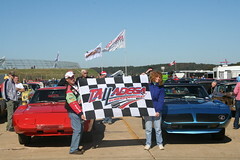 However, we do know that in 2014 we will be back at Dega! Some participants brought their own sleeping quarters and comforts of home with them. Do you have the keys? I don’t have the keys! There was an excellent array of race cars including this Ramo Stott number 07. Unfortunately we heard of a number of mechanical issues on the way to and during the event but it did not dampen anyone’s spirits. We had only been off the interstate for a few miles on the second day of our journey, and it seemed that we caught a red light at the bottom of every hill (or should that be mountain?). Since Barry had made the trip 5 years before, he was leading on day 2, with me following very closely, in order that we would not get separated in traffic, or at any of the lights. 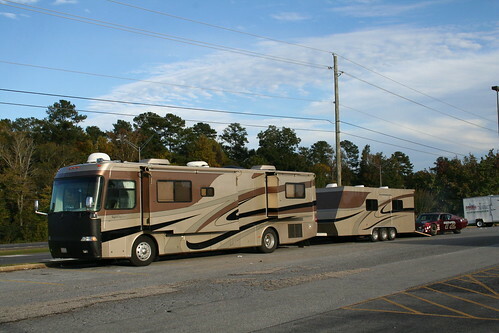 Unknowingly to me, due to a slight error in wiring my trailer brakes (the trailer brake control unit in my truck was wired through the same fuse as my trailer lights, with a 10 amp fuse, instead of through a dedicated 25 amp fuse, as it should have been), I lost my trailer brakes on our first good stop. 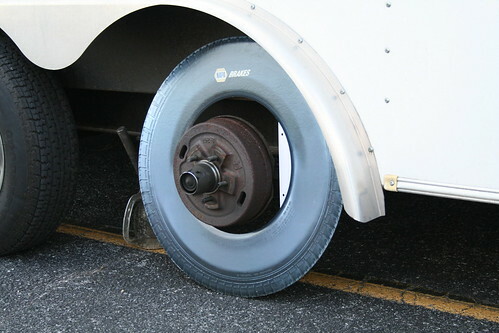 However, with the 4 wheel disc brakes on my ’05 F150, I hadn’t really noticed. After replacing my trailer brake control unit for the return trip home, we realized that my original wiring was slightly inadequate. (Nothing like digging the instructions out of the trash…) We then managed to return home to Indiana without any other incidents. Oh, by the way, we had a great time in Alabama! We are looking forward to our next trip. When you got back on the road if you had needed to go into the median again do you think Barry would have followed you? You were very lucky there was room to maneuver. I think he was more than a little nervous about having me behind him! He actually followed me the rest of the trip, including the entire trip back home.